In this Nov. 24, 2018 file photo, a demonstrator waves the French flag on a burning barricade on the Champs-Elysees avenue with the Arc de Triomphe in background, during a demonstration against the rise of fuel taxes. There are parallels for unpopular French President Emmanuel Macron in the demise of King Louis XVI more than two centuries ago. 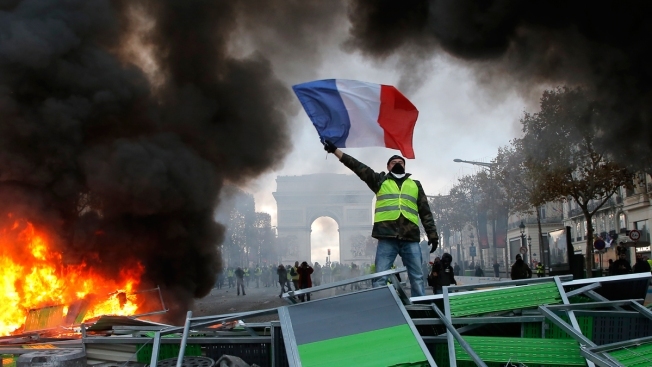 Democracy has replaced monarchy but the culture of a mob taking its anger against perceived inequality onto the streets of Paris has not changed. The national Federation of French markets said Friday that Christmas markets have been "strongly impacted" and that its members registered "an average fall of their estimated figures between 30 and 40 percent since the beginning of the movement of the yellow vests."